Though the thought of growing your own fruits and vegetables seems idyllic, it is rarely a trouble-free endeavor. Weather, insects, animals, bacteria, viruses, and funguses can all wreak havoc with a garden, sometimes causing small amounts of damage and other times causing a total crop loss. This year the cold wet spring weather slowed our summer garden; rabbits, chipmunks, and birds have all done some serious damage; and this week we lost our battle with squash vine borers, garden pests that frustrate gardeners, farmers, and commercial growers. They have pretty much killed off our squash and have now found the sweet pumpkin vines. Something else, probably cucumber beetles, are killing off the cucumber plants, too. 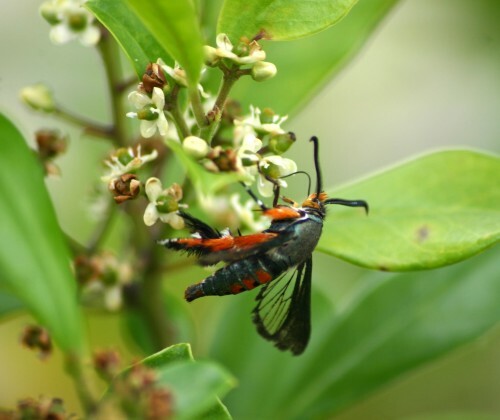 Squash vine borers are moths that are active during the daytime, flying around the plants and laying eggs on leaf stalks and vines. The hatched larvae bore into plant stems and feed for up to 30 days on the plant before moving into the soil to pupate. The pupas overwinter in the soil then emerge in the spring to restart the cycle. Often the first sign of trouble to home gardeners is wilting leaves, at which point the battle is almost lost. Control is challenging and requires multiple steps. The soil should be turned over and pupas destroyed before planting. Some companion plants may be beneficial, such as marigolds (the pungent Mexican, French, or African types), corn, and nasturtiums. Floating row covers protect the plants from the moths during the spring and early summer when they are most active, but must be sealed all the way around to prevent the moths from finding any entry points. Once the blossoms begin to appear the row covers should be removed to facilitate pollination, or you can try hand pollinating under the cover. Plants should be examined daily for signs of eggs or frass (an orange sawdust-like substance, see photo above) indicating that larvae have bored into the stems, at which point you must carefully slit open the stem to remove the larvae. 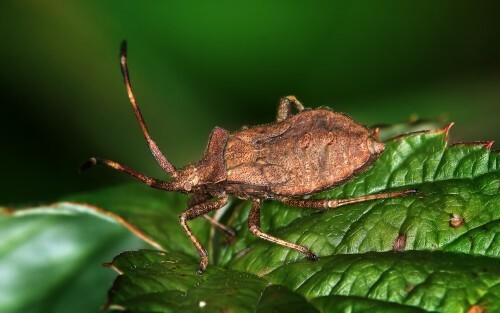 Squash bugs (sometimes known as “stink bugs”) are another difficult pest. The adults overwinter under debris, such as pieces of wood, fallen plants, leaves, stones. Once the weather warms, they emerge and mate, laying eggs on the underside of the leaf, which hatch in 10 to 14 days. Once hatched, the nymphs feed on the plant by piercing it and sucking the sap, at the time injecting a toxin which causes the plant to wilt and die. 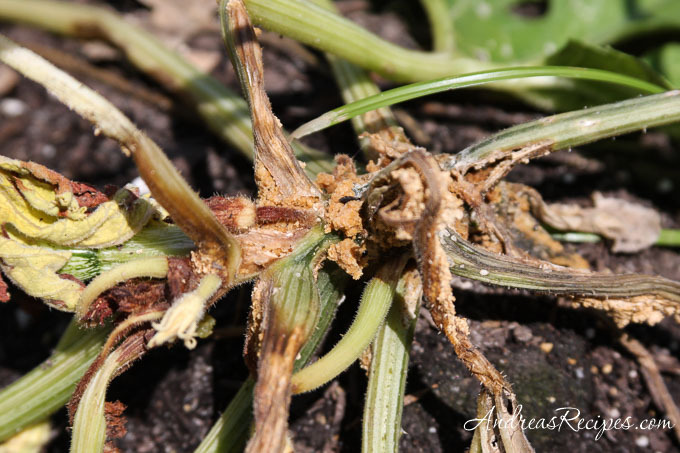 They also transmit a disease called Cucurbit yellow vine decline, which can yellow and wilt a plant overnight, usually within weeks of harvest. If infected early in the plant lifespan, devastation can result. Nymphs mature within four to six weeks and the cycle starts anew. Control starts with cleaning out plant beds, removing all debris and leftover plants from previous seasons. Turn over the dirt and keep leaves from building up in the planting area. Some companion plants may be beneficial, such as radishes, marigolds (the pungent Mexican, French, or African types), mint, and nasturtiums. Use row covers as mentioned above. Check plants daily for infestation, and if you find adults, nymphs, or eggs on the leaves, brush them off and crush them. One trick for catching the bugs is to lay a piece of wood flat on the ground next to a plant. The bugs will often take cover underneath the wood at night, making it easy for you to kill many at once in the morning. 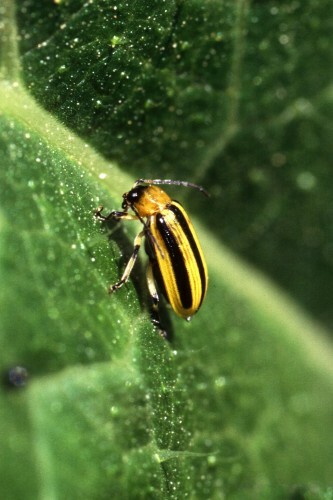 Cucumber beetles damage cucumber, melon, and squash plants at two stages. The adults eat young tender stems and leaves and the blossoms, while also spreading bacterial wilt and cucumber mosaic virus, both of which cannot be treated and will kill a plant. Once the eggs hatch, the larvae (aka corn rootworm) feed on the plant roots. There are two types, the striped beetle in the photo above, and the spotted beetle, though of the two the striped beetle is more of a danger. Both types of adults overwinter in bean and corn fields, or even compost or trash piles. Infested plants should be removed and disposed of immediately. Using row covers helps prevent them from reaching susceptible plants. Consider adding a bat house to your garden, as they enjoy eating cucumber beetles as well as a broad range of other nuisance insects. Some companion plants may be beneficial, such as radishes, marigolds (the pungent Mexican, French, or African types), broccoli, catnip, and nasturtiums. Visit the sites listed in the References below for more detailed information on these pests and methods of control. Very informative stuff about garden raiders, I didn’t know that. Our biggest problem this year was snails targeting my basil. I haven’t had a problem since moving the basil to my back deck in a window box. This has been a particularly tough year for growing food. Oddly enough, though we have had weather the opposite of yours (way too hot and dry), the pest infestations remain the same. At this point only the bats and birds are happy. Most gardeners in these parts are in hospice mode with watering restrictions, laughing at nursery plant sales (no plant is inexpensive enough to buy and allow to die for lack of available water) and looking out the window as the garden fades to yellows and browns. Next year! Chris, we managed to get off without slugs or even tomato hornworms this year, which is fine by us since the rest of the pests have had us at our wits end. TexasDeb, I feel for you. We had drought two summers ago with watering restrictions and didn’t get much out of the garden. Hopefully you’ll have better weather next year. Can you grow in the winter? Oh, I love your garden, Andrea! 🙂 Read your piece on DC Moms. Am glad it all turned out well for you! I feel your pain! Our beloved pumpkins have fallen victim to the stink bug/squash bug. Love your photos.